Personal: Nickname “Rhino” earned from his T-Ball coach because of his intensity…California native…Member of USBC Board of Directors. 2019: Finished third in PBA Cheetah Championship losing to Rhino Page 229-204 in semifinal match...Finished fifth in Lubbock Sports Open losing to Kyle Troup 198-186 in opening stepladder match...Finished fifth in season opening Hall of Fame Classic losing to Jesper Svensson 201-198 in opening stepladder match...Had third fifth-place finish of season in Go Bowling! PBA Indianapolis Open losing to Wes Malott 242-190 in opening stepladder match. Career: In 2018 finished fourth in Xtra Frame Kenn-Feld Group Classic losing to Brad Angelo 228-225 in opening stepladder match. Finished fifth in USBC Masters losing to Steve Kloempken 243-211 in first stepladder match. Won 2018 ESPY award for best bowler.Won 2017 U.S. Open by defeating Jakob Butturff in title match 256-222 for first major and sixth career title. Won Xtra Frame Kenn-Feld Group Classic by defeating Chris Via 190-173 in title match for fifth career title and ending eight-year singles title drought. Finished second in Xtra Frame Wilmington Open losing to Anthony Simonsen 224-177 in title match...In 2016 Won fourth career Tour title as member of Merica Rooster Illusion team that won PBA Team Challenge...In 2015 Finished second in Barbasol PBA Tournament of Champions losing to Jason Belmonte 232-214 in championship match. Was second runnerup after also finishing second in 2009. Finished fifth in Rolltech PBA World Championship losing to Scott Norton 215-202 in opening stepladder match. Finished third in Badger Open. Earned first George Young high average award with 227.14 average...Won one title in each of his first three seasons on tour…Won the Viper Championship in 2009-10 for his third career title...Finished second in 2009 Tournament of Champions…Made a rookie record five championship round appearances on his way to Rookie of the Year honors in 2007-08…Won 2008 GoRving Classic in fifth championship round appearance...All five TV appearances came after advancing from the PBA Tour Qualifying Round, also a PBA record…Bowled televised 300 game in 2009 DyDo Japan Cup – the first ever on Japanese television – to earn a $100,000 cash bonus and finished third in that event… Holds the PBA’s seven-game scoring record of 1,883 which he set in Baltimore in 2007…Broke the rookie record for earnings in a season with $83,811…Second bowler ever to win a title after advancing through a TQR…Holds PBA records for most times advancing through the TQR (12) and most times making top 32 match play as a qualifier (9)…Won PBA Experience Showdown special event at the end of 2009-10 season...In 2011-12 got off to a slow start but ended strong with three top-six finishes in the last five tournaments. Had best finish of third in Ricart Ford Open, fifth in U.S. Open and sixth in Tournament of Champions...In 2012-13 finished fourth in PBA World Championship. 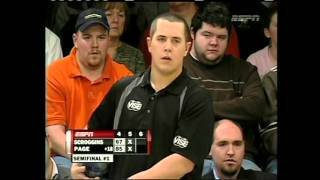 Lost to eventual winner Parker Bohn III 200-170...Owns nine PBA regional titles. in the 2007 Pan American Games…Also won five medals in the 2007 American Zone Championships…Owns over 20 international medals…Won the 2005 U.S. Amateur Championship…Won team and doubles gold, all-events silver and trios bronze medals for Team USA in 2008 WTBA Men’s World Championships…Bowled for the University of Kansas where he was a member of the 2004 Intercollegiate Bowling Championship winning team…Named 2004 Intercollegiate Bowling Championship MVP…First-team Collegiate All-American in 2004-05 and Honorable Mention in 2003-04. 2016 Tony Reyes Community Service Award winner.